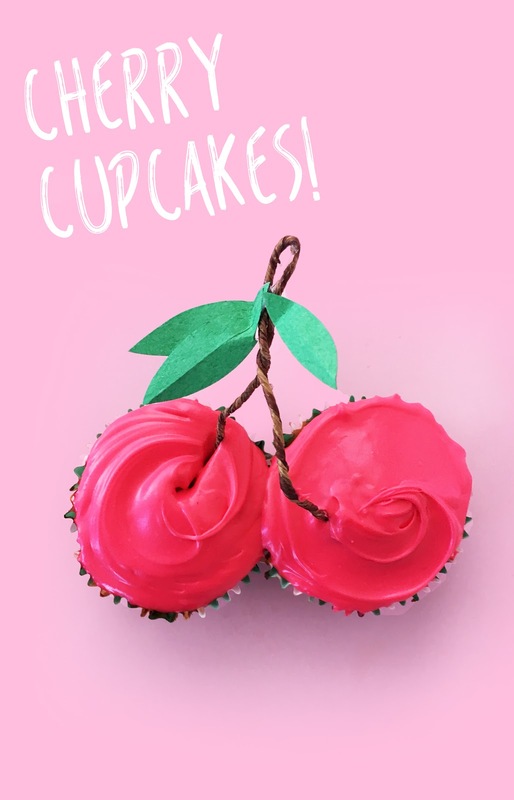 Easy Cherry Cupcakes! / Hey, EEP! I was searching for a snack in the fridge the other day and came across a jar of maraschino cherries. I thought, "imma bake something with these," cuz (real talk) I probably bought them a year ago...used them once for a sundae...then totally forgot they existed. Anyway! 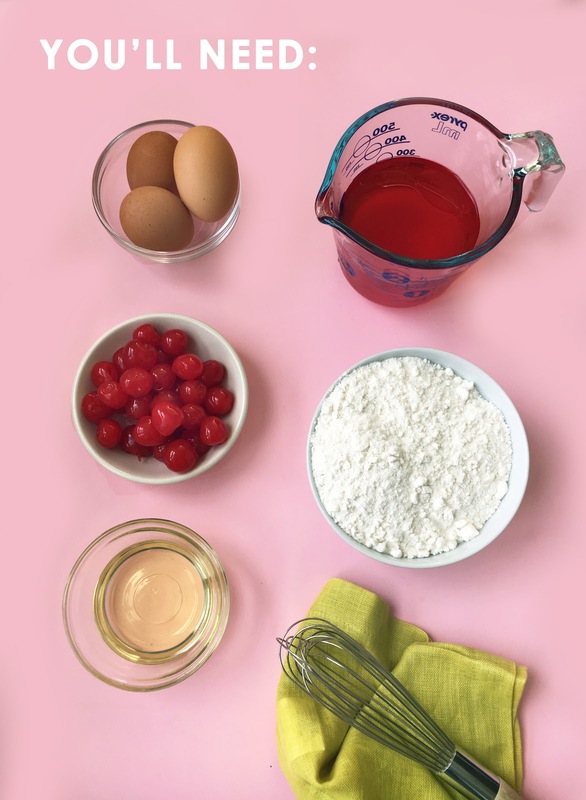 I thought it would be cool to doctor cake mix with maraschino cherries. If you're going to go for it, why not really go for it? You know what I mean? 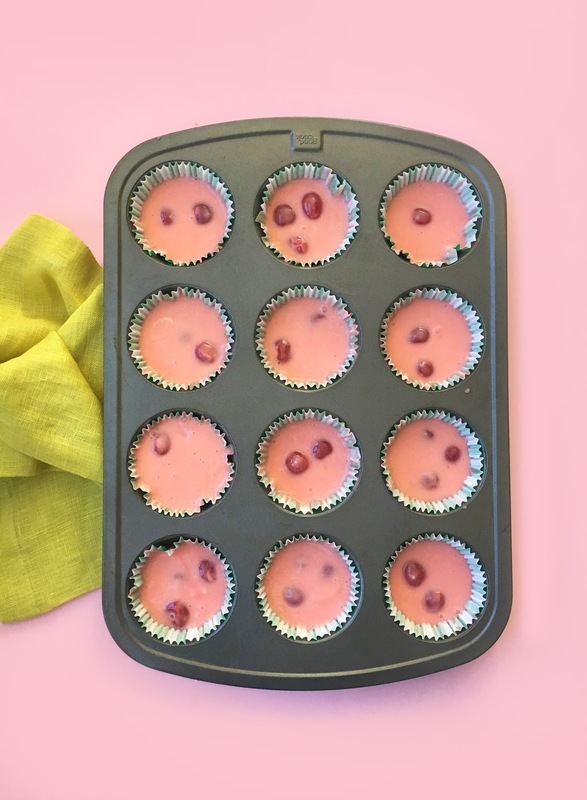 You can make this recipe with any flavor cake mix you like, just replace the liquid with the maraschino cherry juice from the jar (cut with however much water you need to create the full amount listed on the box instructions) and add the cherries to the batter separately! For the stem, I bent small piece of floral wire to create V shapes. That's the base! For he leave, I cut out regular green construction paper and hot glued two or three pieces to the stem base. Group two cupcakes together, add your stem and you're set! 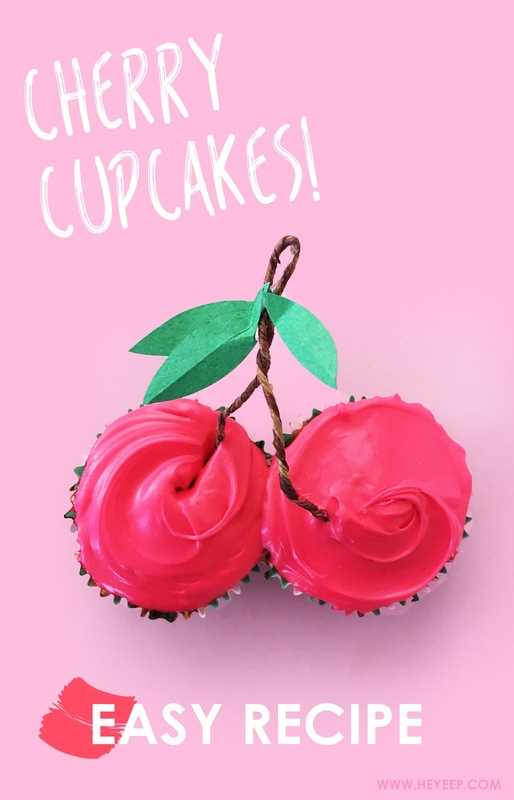 This would be even cuter if you used a mini cupcake pan and made tiny versions of the cherry stems. I mean, I guess two mini cupcakes I better as a single serving than two regular cupcakes...but who am I kidding, I always eat two full ones anyway. One for each hand right!? 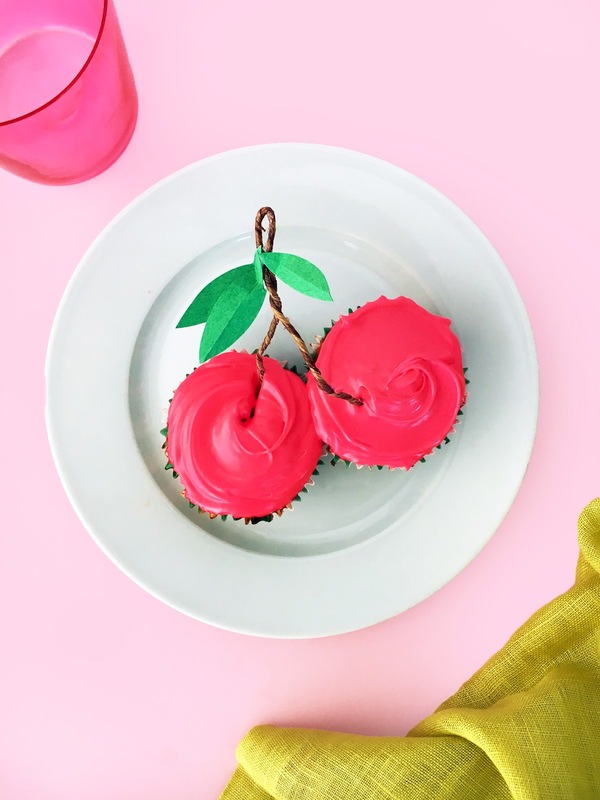 I'll share the full recipe for these cherry cupcakes below. 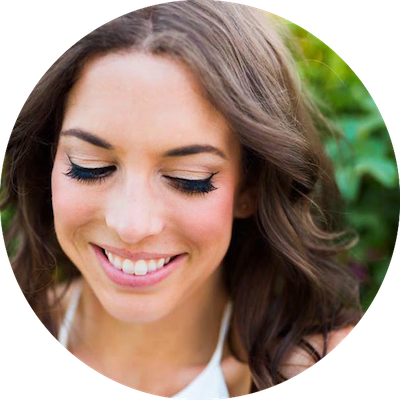 If you're looking for even more cherry print fun, check out this product roundup of all my summer cherry faves! 1. Preheat the oven to 350˚F and line a muffin pan with paper liners. 2. 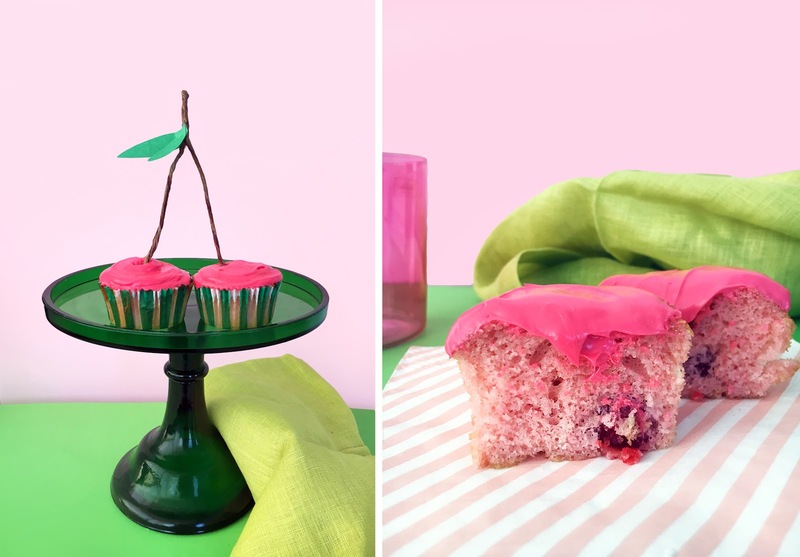 Make the cake: Set a strainer over a liquid measuring cup. Pour the cherries into the strainer, separating the liquid from the cherries; reserve both separately. 3. Look at the instructions on your cake mix box. There are measurements for the egg, oil and liquid that you need to add. Do you see the liquid measurement (usually water or milk)? Add water to the liquid measuring cup with the cherry juice to reach that amount. 4. Scoop 1 to 2 tablespoons cake mix from the package and toss with the reserved cherries to coat. This will keep them from sinking in the batter. 5. Prepare the cake mix as the label directs, replacing the liquid with your cherry juice mixture. Stir in the cherries. Divide batter among the prepared cups and bake as the label directs. Remove from the oven. Let cool in the pan for 3 minutes, then transfer to a wire rack to cool completely. 6. 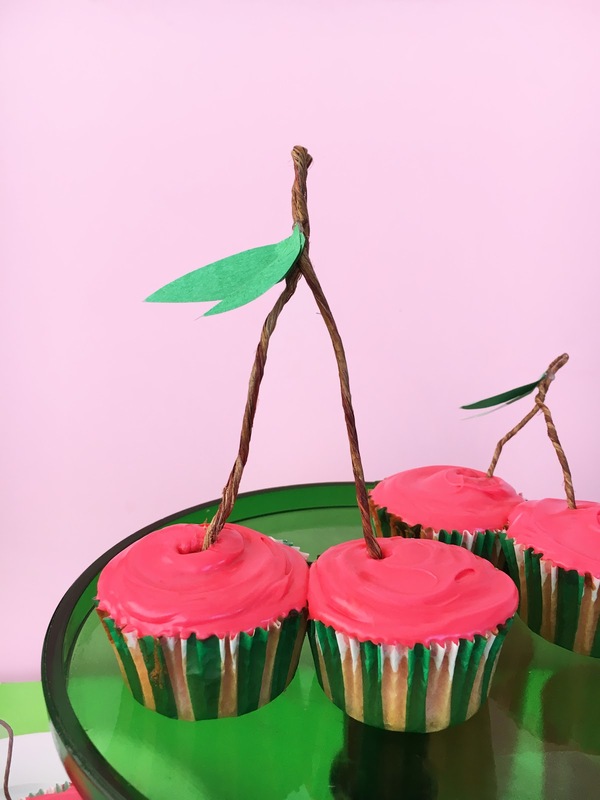 Meanwhile, make the cherry stems: Cut floral wire into sections using scissors. Bend to create V shapes. 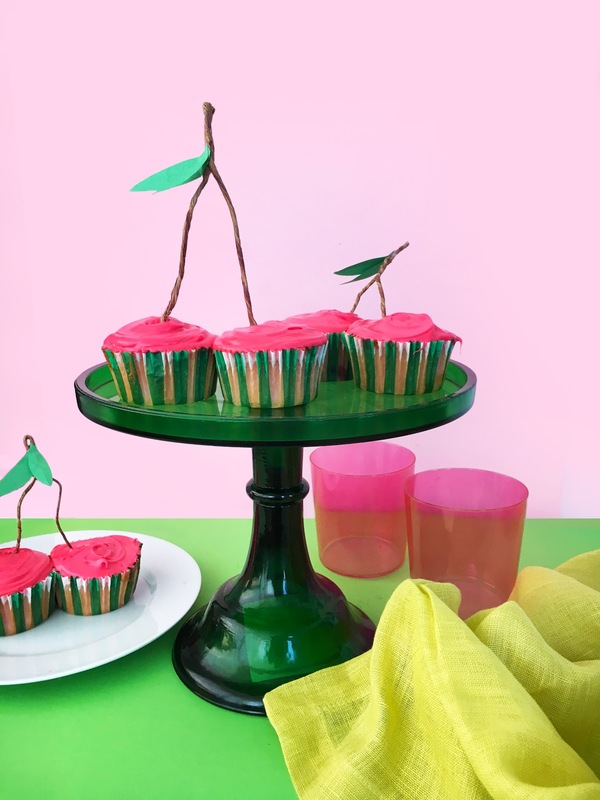 Cut out leaves from green construction paper and glue to the stems using hot glue. 7. 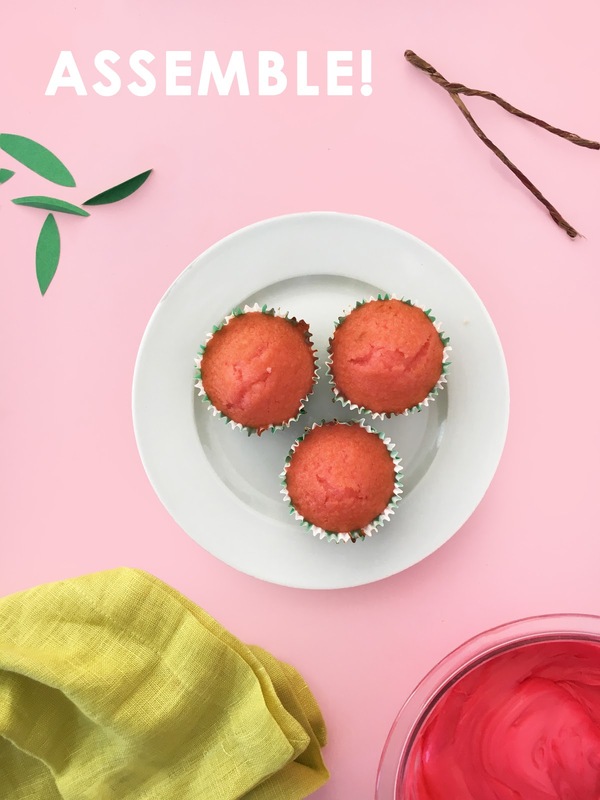 Once the cupcakes are cool, frosting with red frosting. 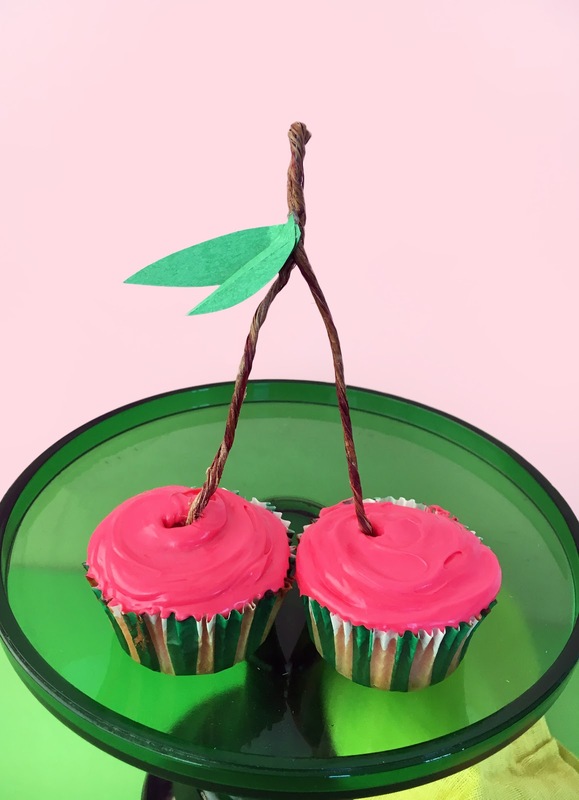 For each cherry, arrange 2 cupcakes together and add a stem. 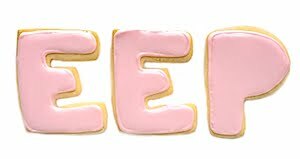 I'd love to know what you think about the past few cake recipes! Are you liking these? 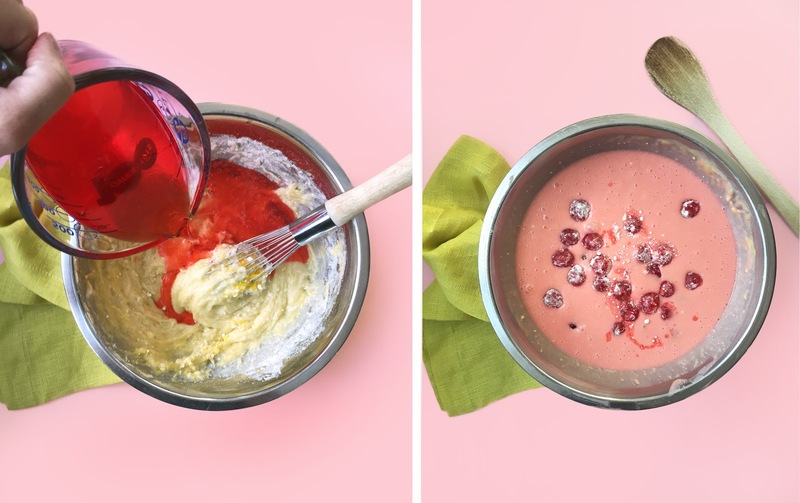 Do you like using cake mix or do you prefer making your batter from scratch?